Thanks to Harvey Weinstein, I have not seen Bong Joon-Ho's Snowpiercer movie yet, based on the 1982 French graphic novel La Transperceneige. But I have been able to read the comic, thanks to Titan, who will be releasing its first-ever English translation on January 28th. If you're at all interested in the movie or just in reading one of Europe's best comics, I highly suggest climbing aboard. 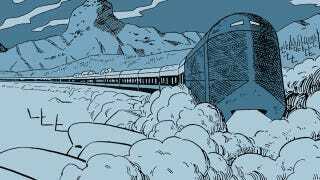 If you've seen the trailers for the movie, you know the deal: The earth has succumbed to a new ice age, and the last remnants of humanity live on a single train called the Snowpiercer, which travels the world thanks to its perpetual motion engine. The train is 1,001 cars long, and the lower classes live crammed together in squalor in the back of the train, while the upper classes live is space and luxury in the front. Snowpiercer is hardly the first story to examine a classist dystopia, but what makes it unique is its refusal to adhere to any of its predecessors' conventions. Proloff is an escapee from the back, who managed a dangerous trek outside of the train to literally advance his life, but he's not trying to lead a revolution or improve his people's lot. Adeline is a socially conscious woman from the middle-class who hopes to improve the lives of the people at the tail, but her plans are instantly derailed when her contact with Proloff forces her into quarantine. It won't surprise anyone to known that the upper classes hate and fear the people at the rear of the train, and have some diabolical plans for them, but the fact remains that in a certain sense the lower class is literally threatening not just the society of the Snowpiercer, but the lives of everyone on board. But it's definitely not your standard tale of social equality triumphing over a discriminatory future world, because it's augmented by how wonderfully real yet weird the Snowpiercer is. As Proloff and Adalind journey through the train — a process that takes several days — they pass through cars full of zealots who worship the trains engine, a brothel car for the upper class, and most disturbingly, a car for "Mama" — a giant, living, regenerative protein that feeds the train's inhabitants. And that's to say nothing of the looks into the lives of the people who live on board, in all sections of the train (or the secrets of the Snowpiercer itself). This combination of the mundane and the bizarre, well-trod dystopian scifi tropes, and Snowpiercer's abandoning of the standard "hero-overthrows-the-evil-regime" plot, combines to make it not just an excellent comic and an engrossing read, but one that feels like it was written yesterday instead of 32 years ago. Author Jacques Lob has made Snowpiercer truly timeless, and while Jean-Marc Rochette's black-and-white art, full of marvelously expressive faces yet evocatively minimal backgrounds, establishes the harsh reality of life onboard a single train almost perfectly (it can be hard to keep track of some of the lesser characters sometimes, especially the multitude of similarly faced guards and soldiers). If you're a scifi fan or a comic fan, I highly recommend picking up Snowpiercer Vol. One: The Escape; while the first volume is what Bong Joon-Ho's movie seems to be primarily based on, Titan will release the two other volumes in the Snowpiercer saga later this year (these were written by Benjamin Legrand and published in 1999-2000, after Lob's passing). Certainly it's a marvelous entry into the genre, and one of Europe's finest comics works. And if nothing else, it'll give you something to read until the movie finally makes its way over here.